The current church is at least the fourth church in the parish and is a fine example of “Arts and Crafts” style and craftsmanship. The previous structures were built on a different site to the north, where an old churchyard still exists. A separate page gives details of the old churches. The last church on the old site was struck by lightning on Friday 10 July 1874 and largely destroyed by fire. There was a great sense of urgency about the provision of a replacement – although services continued to be held in the newly built schoolroom. The 7th Earl Cowper had only recently provided the site for both the school and schoolhouse and he generously donated an adjoining site of half an acre for the new church. 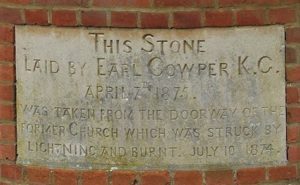 The foundation stone – which came from the doorway of the destroyed church – was laid on 7 April 1875 not by Lord Cowper (as it says) but by his wife; he was unwell on the appointed day. 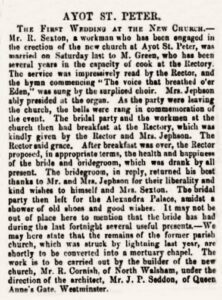 The rector at the time of the building work was Rev Henry Jephson and it seems likely that the social connections of both Reverend and Mrs Jephson were helpful in raising funds towards the building. St. Peter’s was designed by a famous architect, John Pollard Seddon FRIBA (1827-1906). It is generally acknowledged to be very fine and is a listed building. The choice of J.P. Seddon followed an open competition. It is clear that J.L. Pearson, who had designed the earlier Victorian church and the rectory, was (perhaps understandably) not best pleased by the decision. In a letter to Rev. Henry Jephson enclosing a claim for his expenses for visiting the site in the sum of £5 19s. 3d. he wrote: “no doubt there was sufficient reason for not employing me.” The building contract was awarded to Robinson Cornish of Tudor House, North Walsham, Norfolk (later called Cornish & Gaymer). 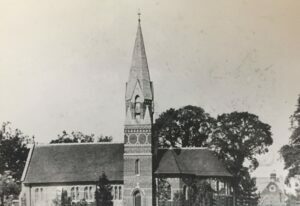 Within just over six months – on 26 October 1875 – the present church was dedicated by the Bishop of Rochester (who was also by this time the first Bishop of St. Albans). The chancel arch in St. Peter’s is unique; it was the first and only commission by the famous Martin Brothers for a church. The Martinware Pottery was started in Fulham in 1873 by Robert Wallace Martin, the eldest of the four brothers. In 1877 the business moved to Havelock Road, Southall, where it remained until it closed in 1923. 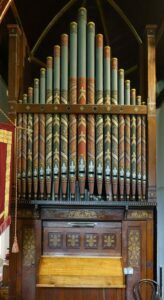 J.P. Seddon designed the lectern, which was donated by Robinson Cornish, the builders. 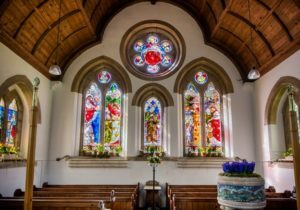 Some of the original stained glass was also designed by the architect. 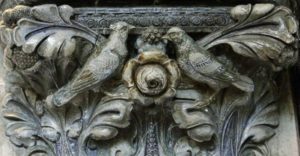 The fine stone pulpit was carved from Caen stone by Agnes Bonham, and donated by Mrs. Robinson of Ayot Bury. The font and the bells were the gift of the rector’s uncle, Dr. Henry Jephson (1798-1878). 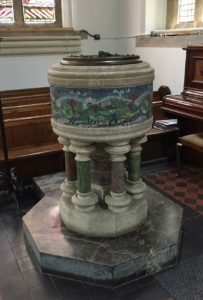 The mosaic work around the font was created by the acclaimed London firm of Jesse Rust. 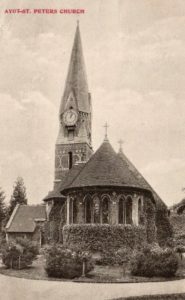 The cost of the new church exceeded the estimates somewhat and accordingly some internal fittings and furnishings, the clock and the vestry were not ready to be dedicated by the Bishop of St. Albans until 8 February 1898. 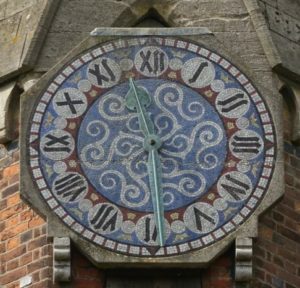 It appears that Mr. Charles Willes Wilshere paid for the vestry, because on one of its internal walls is to be found one of his chronograms. These were placed on buildings which he designed or paid for. 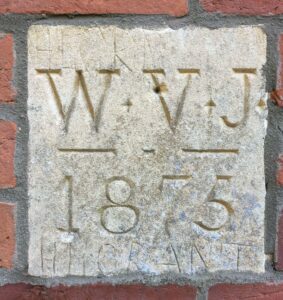 The date of construction is picked out in red capitalised letters; if the Roman numerals (V=5, X=10 and so on) are totalled the result is 1897. The inscription commemorates the 25th year of Rev. 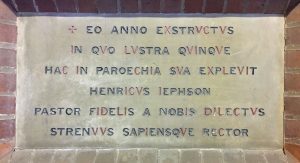 Jephson’s service as rector, and can be roughly translated as:- In the year of construction, our parish had been occupied by our rector Henry Jephson for twenty-five years, he being faithful, beloved, hard-working and wise. Much of the stained glass was added after the church was completed. All the windows at the back of the church are dedicated to the memory of Jane Ann Robinson of Ayot Bury (who had paid for the pulpit) and who died in 1879. Other windows commemorate the Wills brothers and Janet Chambers who died in 1878, 1880 and 1892, Annie Catherine Boulton who died in 1894 and the Thompson children who died in 1874 and 1875. 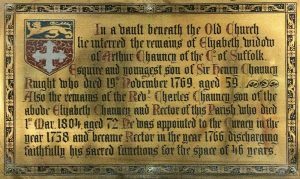 A brass wall plaque inside the church records the burial of the Reverend Charles Chauncy and his mother Elizabeth. 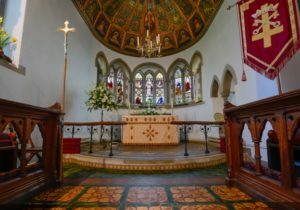 They were buried in the octagonal church in the old churchyard that existed from about 1750 to 1860. There is an error on the plaque as the burial register shows Elizabeth’s burial or death as 19 November 1767, not 1769. It is thought that this plaque may have been placed in the new church at the request of the junior Reverend Edwin Prodgers, since his wife was related to the Chauncy family. The wrought iron screen was erected in 1908, paid for by Selina Still in memory of her mother Agnes Frances Marten (née Mount) who died in 1906, and her step-father Rear Admiral Francis Marten, who died in 1891. Selina Still was the child of Agnes’ first marriage to Rev. Henry Hughs Still and she died in January 1912. None of these individuals are buried in Ayot St Peter. Another view of the church before the vestry was built in 1897, showing the door leading directly into the base of the tower. The school house can just be seen in the background. 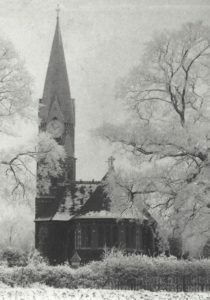 The exterior appearance of the church was altered in 1919 when the war memorial was unveiled. This records the names of twenty men killed in the first world war. More details about these men can be found here. 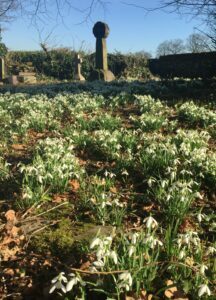 The first burial in this churchyard took place in 1919, although burials continued in the old churchyard until 1945. 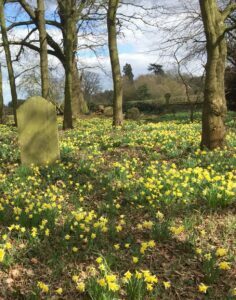 It is thought that many people preferred to use their family plots on the old site, and there was a mortuary chapel in the old churchyard (fashioned from part of the previous church) until 1954. 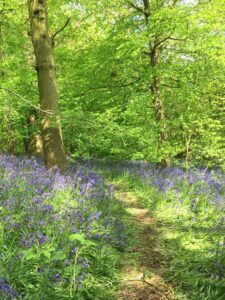 A free quarterly newsletter is available for people with loved ones commemorated in either churchyard, please contact us if you would like to be added to the mailing list. 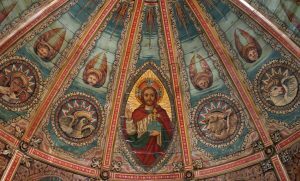 More information about the church architect John Pollard Seddon can be found here. 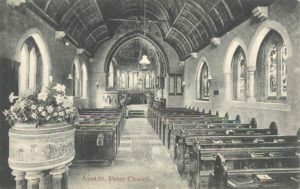 I am indebted to Peter Shirley for the above text, much of which is taken from the book “Ayot St Peter – a Parish History” published in 2000.